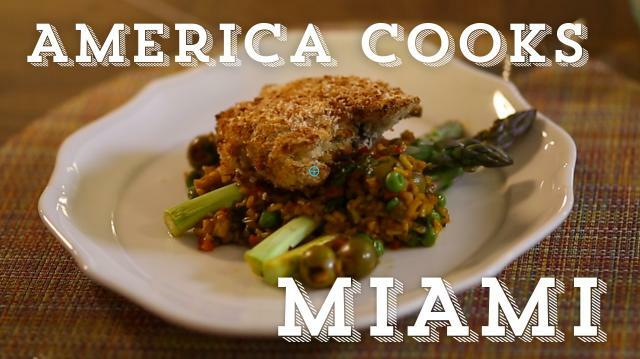 America Cooks heads to Miami, where James Beard Award-winning chef Michelle Bernstein works with singer Michael Angelo Gonzalez to create a healthier (and affordable!) version of fried chicken & arroz con pollo. Heat the oil in a pan over medium heat, add the garlic. Shake the pan until golden, season with salt and remove from the heat. Add the juices and adobo. Mix well. Add the herbs and spices. Pour into a bowl. Marinate the chicken thighs for a few hours or overnight, if possible. Remove the chicken from the marinade and place into the panko breadcrumbs, press the breadcrumbs firmly onto the chicken. Place on a cookie sheet and bake at 350F for about 50 minutes then raise the heat to 375 and bake for another 15 minutes or until golden. Heat the oil in a large, deep, heavy-bottomed skillet over medium heat. Add the onions, red peppers, and green peppers, and garlic and cook, stirring, until softened, 5 minutes. Add the rice and spices and keep stirring about 3 minutes. Stir the tomato paste, stirring vigorously until coated. Stir in the stock. Add herbs. Bring the mixture to a simmer, and let simmer for 5 minutes.Stir in the olives, peas, beer and hot sauce. Cover and cook until the broth is largely absorbed by the rice, about 45-50 minutes. Uncover the skillet, add the asparagus to the top and let simmer until the liquid is almost completely reduced, about 5 minutes.